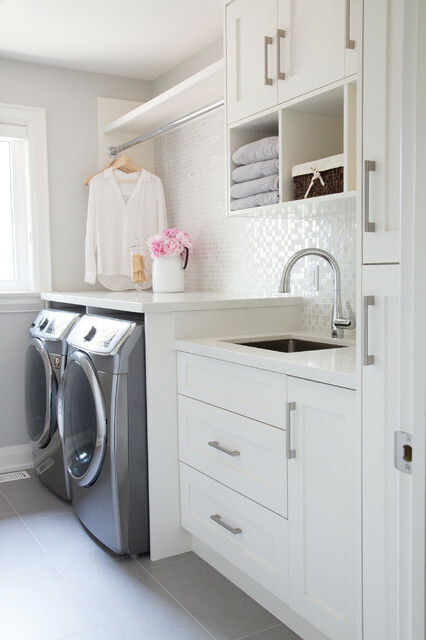 Would love to know dimensions of the room + appliances - Love the use of small space here - wondering what the width and depth of the room is (as we want a similar set up in our laundry. what's the distance between the front of the appliances and the wall (not in picture) and I'm assuming that's a smaller laundry sink? 9. Show your laundry some loveThe cooler months mean you’re likely to be using the dryer a little more often. Make sure you clean the lint filter regularly, at least weekly. This is an easy but important task for a number of reasons, not least of which is the fire hazard a loaded filter can present. A nice clean filter will make your dryer more efficient and will result in lower power consumption, and therefore lower bills.Install some indoor hanging space for hanging damp laundry on a rainy, cool day. If you’re pressed for space, think about suspending a hanger from the ceiling or keeping a foldable and portable clothes horse handy. Note “wall” that drops down right side; could do same on my left side. How much space between washer and dryer?